By Nick Ostdick. Nov 11, 2016. 9:00 AM. It’s a central question in the journey of any artist: How do you bounce back from a project that didn’t meet audience expectations? 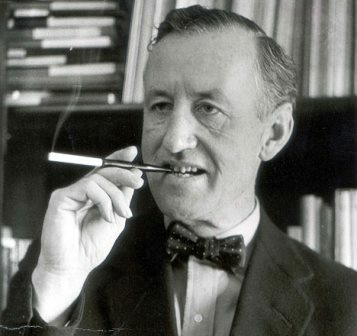 For novelist Ian Fleming, the answer lies in the publication of his seventh James Bond novel, Goldfinger. Coming off a somewhat tepid response to his previous novel, Dr. No, Fleming was determined to turn out a Bond story that would not only further the development of the series and its central character, but also give readers what they had come to know and love in the Bond series—action, adventure, thrills, romance, and style. And Fleming’s efforts to write a ‘return-to-form’ novel paid off handsomely. Published in 1959, Goldfinger is one of the more revered entries in the Bond series, garnering widespread critical acclaim and bestseller sales figures in both the U.K. and United States. Many Bond scholars argue Goldfinger also succeeded in helping to deepen and even redefine Bond’s character, particularly in relation to his somewhat hollow portrayal in Dr. No. Additionally, some scholars believe the development of Bond’s character throughout Goldfinger heavily influenced how Fleming approached his hero throughout the rest of the series, making Goldfinger a seminal work in the Bond canon. While not necessarily a comeback novel, it’s clear Goldfinger was a statement from Fleming that 007 still had life left in him and both he and his character had so much more to offer. Structured in three acts based on the way Bond meets and interacts with the novel’s main villain, Auric Goldfinger, the novel opens with Bond being asked to observe Goldfinger during a card game in Miami to determine whether Goldfinger is cheating. Bond discovers Goldfinger is in fact cheating with the help of a female accomplice, Jill Masterton, with whom Bond has a brief fling after thwarting Goldfinger’s attempt to swindle his card playing opponent. Goldfinger has Masterton killed shortly after the fling via suffocation by covering her in gold paint. Bond then returns to London where M tasks him with continuing to observe Goldfinger based on suspicions he’s smuggling gold to help finance operations with SMERSH. In an effort to increase his surveillance, Bond sets up a round of golf with Goldfinger under an assumed name in which Goldfinger attempts to cheat Bond out of the game; Bond discovers this, foils the plan, and is invited back to Goldfinger’s estate where he escapes potential capture via Goldfinger’s right-hand man, Oddjob. Bond then travels to Switzerland to spy on Goldfinger’s industrial operation and encounters Jill Masterton’s sister, Tilly, who is attempting to exact revenge on Goldfinger. The two are captured, Bond is tortured by Oddjob, and Bond then poses a rouse to Goldfinger promising to work for him in exchange for his life. Bond and Masterson are taken to Goldfinger’s New York City headquarters where they learn about Operation Grand Slam, Goldfinger’s plan to steal the entire U.S. reserve of gold from Fort Knox. However, Bond secretly provides this information to his CIA counterpart Felix Leiter, who orchestrates a secret response to Goldfinger’s plot, thus foiling the caper. Bond and Goldfinger face-off once more after Bond is essentially kidnapped aboard a private jet transporting him back to London. The final battle results in Oddjob being sucked out a broken window and Bond strangling Goldfinger before ditching the plane off the Canadian coast. Originally conceived and composed under the title The Richest Man in the World, Goldfinger was written at Fleming’s Goldeneye estate in Jamaica during January and February 1958. Goldfinger was the longest manuscript Fleming had produced at the time, and much of the novel’s early scenes were actually composed as disparate short stories Fleming then wove together to create a cohesive narrative arc. The novel features what critics and scholars have referred to as a ‘deeper, more complex portrait’ of 007, which Fleming very much intended coming off the harsh critique of Bond’s character in Dr. No as one dimensional and flat. In writing and rewriting sections of the novel, Fleming made deliberate strides to humanize Bond and offer greater insight into his past and overall emotional core. Published by Jonathan Cape in the U.K., the novel is one of the longer entries into the Fleming canon at 318 pages. Goldfinger shot to the top of bestseller lists both in the U.K. and United States, and, unlike previous Bond novels, Fleming did a number of promotional appearances in support of the book in large part due to its critical and commercial success. The book has been adapted several times for film and television, and the 1964 film version starring Sean Connery as James Bond is widely considered to be one of the best Bond films, despite some significant breaks from the story and characters in the novel. 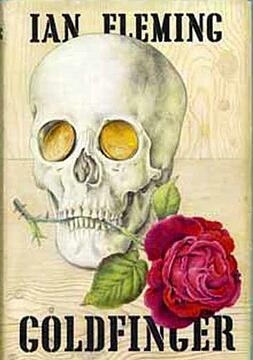 For the cover of Goldfinger, which features a skull with a rose clenched it its teeth against a wooden backdrop, Fleming collaborated with artist Richard Chopping and provided Chopping with much direction for the design and conception of the cover art. Because so many copies of the novel’s first printing were distributed to libraries, pristine copies can be hard to come by and these library-issued copies are much less valuable than others from the original first edition—in addition, collectors should be watchful of the attempted removal of library stamps or other alterations to the original work in an effort to ‘restore’ library copies. First editions of Goldfinger should prominently display the publisher’s—Jonathan Cape's—name on the front and back title page, and collectors should note copies with blurbs or quotes from critics or literary publications on these pages are second or third printings and should be considered slightly less valuable.